In the third quarter of 2018, the net income from financial operations of credit institutions engaged in banking in Finland amounted to EUR 609 million and their operating profit was EUR 350 million. Compared to the corresponding quarter of the previous year, net income from financial operations decreased by EUR 21 million and operating profit by EUR 101 million. These data derive from Statistics Finland’s financial statement statistics on credit institutions. In the third quarter of 2018, credit institutions engaged in banking in Finland accumulated EUR 1.2 billion in interest income and EUR 616 million in interest expenses. The net income from financial operations calculated as the difference between these was EUR 609 million. Compared to the corresponding quarter of the year before, net income from financial operations decreased by EUR 21 million, that is, around 3.4 per cent. Due to the renewed FINREP reporting practices of credit institutions, the net income from financial operations is not, however, in all respects fully comparable between 2018 and previous years. Administrative expenses are the single largest expenditure item of banks operating in Finland. In the third quarter, banks had EUR 669 million in administrative expenses, which was EUR 99 million less than in the year before. Wages and salaries represented 44.3 per cent of administrative expenses. Compared to the third quarter of 2017, total wages and salaries decreased by EUR 11 million to EUR 296 million. The operating profit, or profit from continuing operations before taxes, was EUR 350 million. Compared to the third quarter of the previous year the operating profit diminished by EUR 101 million. Due to the renewed FINREP reporting practices of credit institutions, the operating profit is not, however, in all respects fully comparable between 2018 and previous years. The aggregate value of the balance sheets was EUR 383 billion. The balance sheet was 2.9 per cent up from one year ago. The share of own equity in the total of the balance sheets was 4.0 per cent or EUR 15 billion. 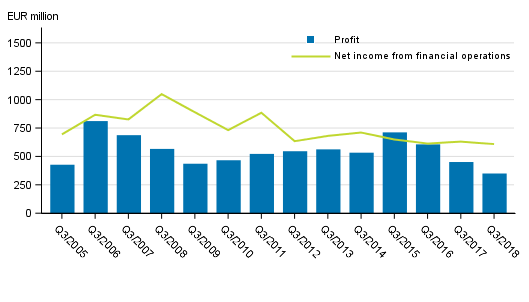 Compared to the corresponding period of the previous quarter, banks’ own equity declined by EUR two billion. Due to the renewed FINREP reporting practices of credit institutions, the balance sheet items are not, however, in all respects fully comparable between 2018 and previous years. A company restructuring made in the Finnish banking sector in the first quarter of 2018 explains part of the unexceptional changes in the profit and loss account and balance sheets and, in particular, in equity. ISSN=2342-5180. 3rd quarter 2018. Helsinki: Statistics Finland [referred: 20.4.2019].